'Customerisation' ... What it is and why your Business needs it. ‘Customerisation’ … What it is and why your Business needs it. You might imagine a gourmet burger made to order and delivered to your table by a friendly waitress on a wooden board would be the style of service at a hipster Bondi Beach Burger joint. But in fact it’s McDonald’s Castle Hill, in a move that’s set to revolutionise the customer experience in every McDonalds across the country within three years. The ‘Create your Taste’ initiative allows customers to custom-build their burger from an interactive kiosk, with a choice of bun, ingredients and condiments. 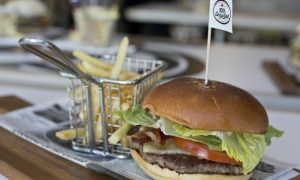 The change also means table-service, allowing customers to relax with a drink while their customised burger is prepared and brought to the table. Providing choice and the power for customers to customise their brand experience is just one way that brands are adding a personal touch to their offering (even those that are mass-produced). The result is word-of-mouth, word-of-mouse and in McDonalds’ case, a much needed positive PR story. Even the simplest of efforts to Customerise (Customising the Customer Experience) can lead to serious wow factor. A few weeks ago, I stayed at the Adelphi Hotel in Melbourne for the first time. Hotel rooms are my home 80-100 nights a year and I’ve been fortunate to experience some of the best hotels in Australia and the United States. Suffice to say, most hotel experiences are fairly similar and mostly unforgettable. The Adelphi is an exception. Not because it’s grander, larger or in a better location than other hotels. Not because the Adelphi rooms have a more comfortable bed, more superior furnishings or fluffier towels. What sets the Adelphi apart is the staff and their unwavering commitment to create a personalised, customised experience for each and every guest. From the moment you check in you are made to feel like the first and only person who has checked into the hotel that day. The Adelphi team don’t make idle chit-chat about the weather; they take a genuine interest in you and what you’re all about (and notably, remember that information in later interactions). Sure, experienced staff at other hotels do that too when you check in. But at the Adelphi, you’re then accompanied to your room and that’s where the similarities with other hotels end. Your check-in consultant welcomes you to your room in person and takes the opportunity to point out a few key things in your room. Boom! With one sentence, this is a hotel experience that has surprised and delighted in the first 60 seconds, cleverly addressing all the common ‘pain points’ most of us have experienced at some point during a hotel stay. Let’s face it – we all resent paying $5 for a bottle of water, $28 a day for WIFI and $15 should we choose to watch a movie. By making them all free, the A delphi has taken a deliberate revenue hit but in doing so, made a very wise investment in creating a simple, powerful point of difference in a competitive Melbourne hotel market. But it was how they’ve turned the impersonal television greeting on its head that was really impressive. Which message would make you feel more valued? While we all strive to find new ways to automate our businesses and marketing processes to achieve scale and improve profits, the challenge will be retaining elements of what I call ‘Customerisation‘ – customising the customer experience. Customerisation often allows you to charge a premium for your product or service. In the case of McDonalds, their research showed that their customers would be willing to pay more for a custom-designed burger than a stock-standard Big Mac. So far, the experiment is working and looks like they may have cracked the holy grail – delivering customerisation in an automated way. How are you delivering customerisation in your business? Leave your comments, ideas and questions below.